mCPBA (meta-chloroperoxybenzoic acid) is an extremely useful reagent most frequently encountered in the synthesis of epoxides. You might see mCPBA, MCPBA, or m-CPBA – alternately used. It all boils down to the same thing. Notice how the molecule looks like a carboxylic acid, but has an extra O. That’s what’s called a “per-acid” – it should be reminiscent of the difference between hydrogen per-oxide (HOOH) and hydrogen oxide (H2O). Note that the oxygen-oxygen bond is quite weak (about 33 kcal/mol or 138 kJ/mol). As we shall see, this is what leads to the high reactivity of these compounds. mCPBA forms epoxides when added to alkenes. One of the key features of this reaction is that the stereochemistry is always retained. 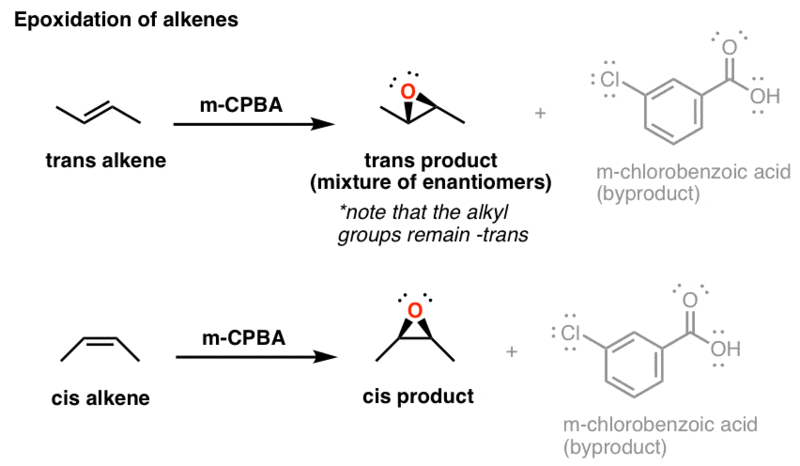 That is, a cis alkene will give the cis-epoxide, and a trans alkene will give a trans epoxide. This is a prime example of a stereoselective reaction. The reaction itself happens through a “concerted” transition state. That is, the bond between the oxygen and the alkene is being formed at the same time that the O-O bond is breaking and the proton is being transferred from the OH to the carbonyl oxygen. Those little dotted lines represent partial bonds. The epoxides that are formed are useful in all kinds of ways. Mostly, they are good electrophiles that will react with nucleophiles such as Grignard or organolithium reagents, hydroxide or alkoxide ions, or (in the presence of acid) water. Another useful reaction of mCPBA – commonly encountered in Org 2 – is the Baeyer-Villiger reaction. This is a rare example of a reaction that results in the oxidation of a ketone – remember that chromic acid leaves ketones alone, for instance. mCPBA can also oxidize aldehydes. The first step of the Baeyer-Villiger reaction is a 1,2 addition of the per-acid oxygen to the carbonyl of the ketone. 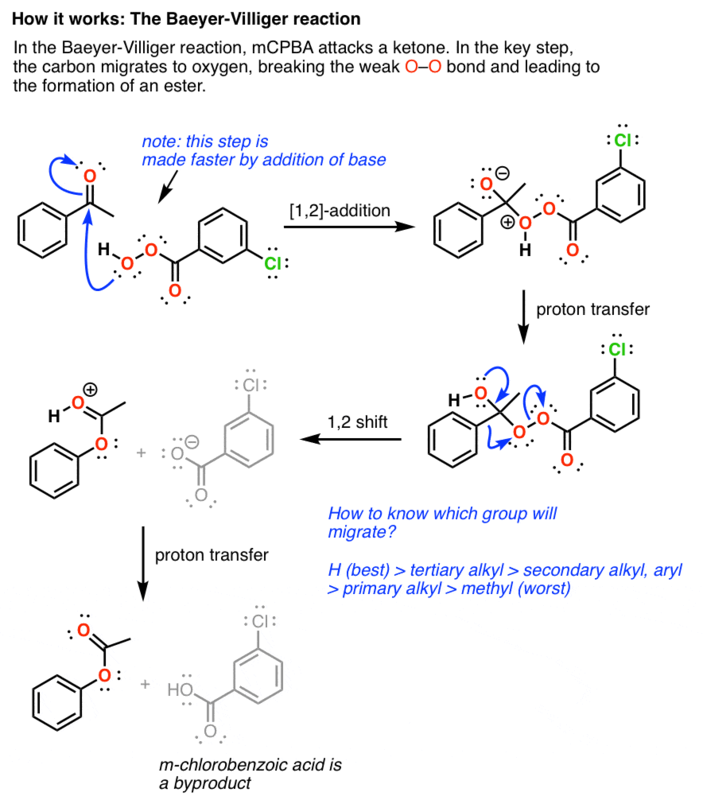 Then there’s a proton transfer. [Note: when the pros do this reaction, they often add a mild base like sodium bicarbonate, which will speed up the reaction by making the conjugate base of mCPBA – a better nucleophile]. Now comes the fun part. The lone pair on the oxygen then re-forms the C=O bond, which then leads to a 1,2-shift of a carbon bond to the oxygen, breaking the (weak) oxygen-oxygen bond and forming an ester in the process. (Remember – if you ever have to sketch this mechanism out, draw the ugly version first). How do you know which bond will migrate? Great question. Migrating group ability corresponds – somewhat – with carbocation stability. Suffice it to say that H is the best migrating group, tertiary alkyls are next, and methyl groups are the worst. Aryl groups (like this benzene group in the example) are at the lower middle range of the scale. Why is this reaction useful? Well, let’s say you have a ketone on an aromatic ring (a meta director) and you want to make the ortho or para product. If you do a Baeyer-Villiger with mCPBA, you will transform it into an ester with the oxygen on the ring (an ortho para director). Now you can add your electrophile. This trick comes in handy. For the record, other peracids like peroxybenzoic acid or peroxyacetic acid will do the same chemistry as mCPBA. mCPBA tends to get a lot of use due to the fact that it is more reactive than peroxybenzoic acid, and also a nicely crystalline white solid. P.S. You can read about the chemistry of MCPBA and more than 80 other reagents in undergraduate organic chemistry in the “Organic Chemistry Reagent Guide”, available here as a downloadable PDF. What if there’s two double bonds? Would the one that has more aklye halides get priority? The double bond attached to more alkyl groups (or fewer hydrogens, if you prefer) gets priority, as it would be more electron-rich. is a by product in about 25 percent yield which is benzoic acid. What is the mechanism for this reaction. Are you sure it’s not a byproduct from the peroxyacid?